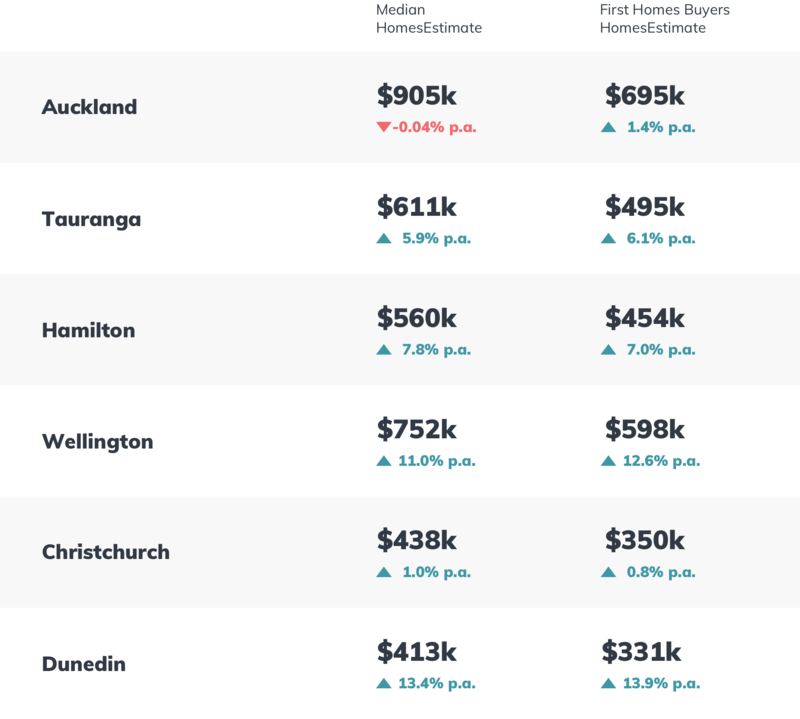 Tauranga and Hamilton – The rate of homes selling for a loss has remained low and steady at between 1 and 3%. Steady, but not spectacular capital growth in these areas seems to be keeping the market performing well. This analysis highlights the changing property cycles that occur and its impact on property prices. When the market is soft as is the case in Auckland, people tend to hold their properties for longer and only sell if they have to. 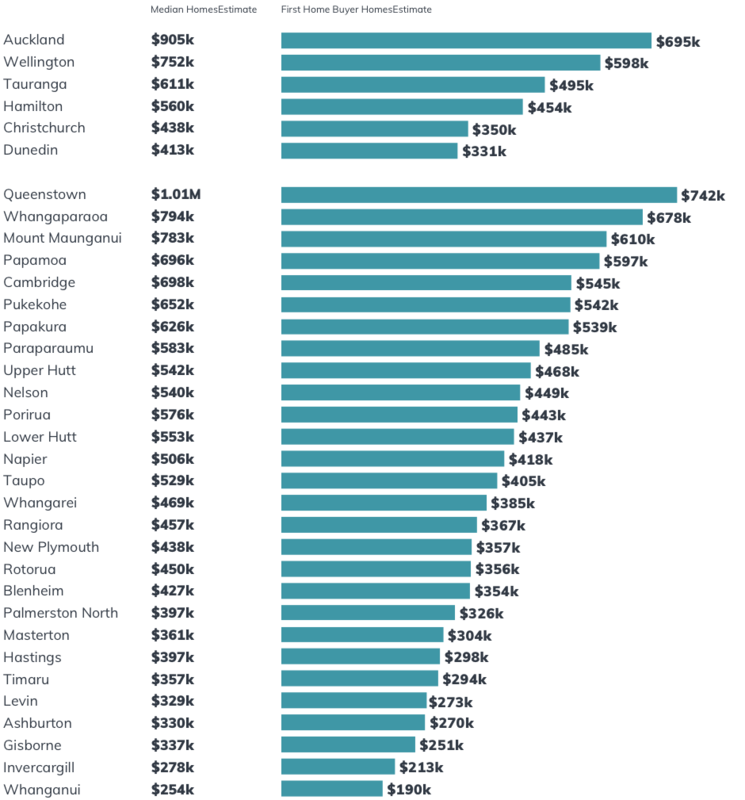 Conversely, when prices are increasing as in Wellington and Dunedin, the length of time owning property decreases as people are keen to realise the capital gains on their property. One thing to remember – It’s important for homeowners to take a long-term view of capital gains ensuring they can withstand drops in property prices and can avoid being forced to sell at a loss. 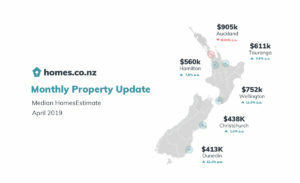 The homes.co.nz Monthly Property Update is generated using homes.co.nz’s April 2019 HomesEstimates, providing an up-to-date perspective on house values around New Zealand. Dunedin goes from strength to strength and has Christchurch in its sights! 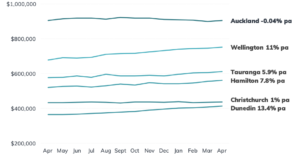 The median HomesEstimate has increased by 13.4% since this time last year. 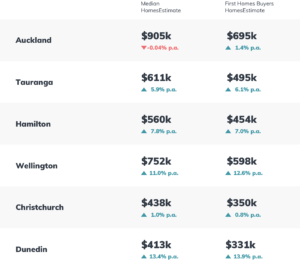 Wellington is also growing strongly with the median HomesEstimate up by 11% and Tauranga and Hamilton continue to show steady, although not spectacular growth with median HomesEstimates increasing by 5.8% and 7.8%, respectively. 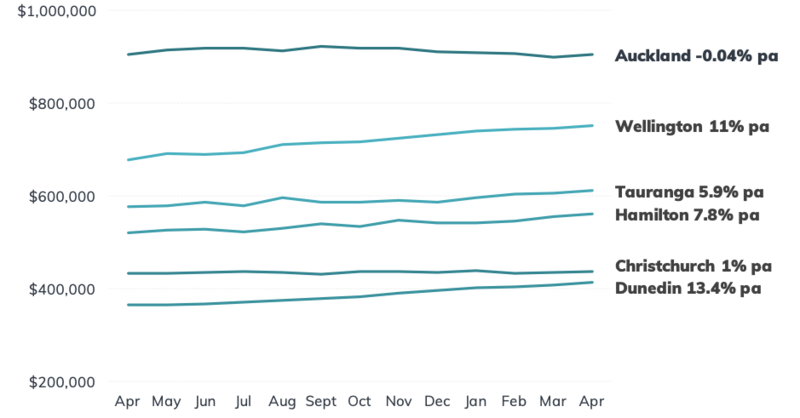 The flat Auckland market continues with a slight decrease since April 2018. 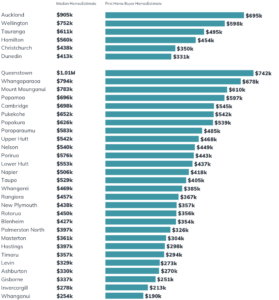 The “First Home Buyer HomesEstimate” is homes.co.nz’s estimate of what a typical first home may cost. It is calculated to be the lower quartile HomesEstimate in a town. 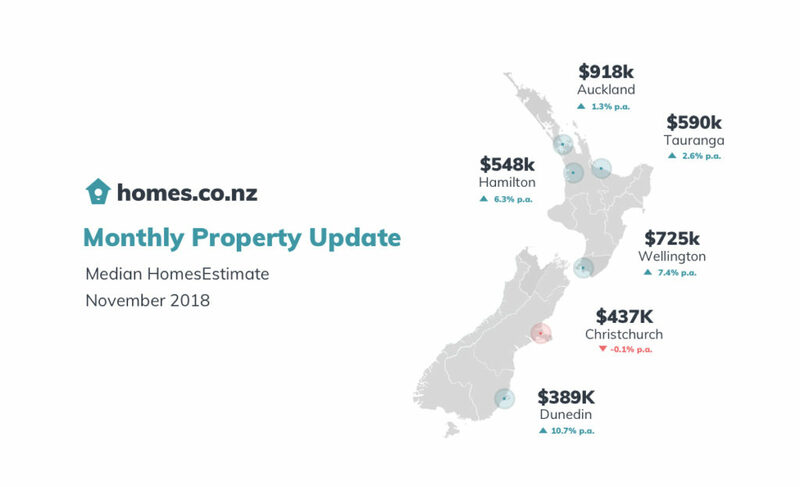 The homes.co.nz Monthly Property Update is generated using homes.co.nz’s monthly HomesEstimates and provides an up-to-date perspective on house values around New Zealand. By valuing the entire housing stock, the homes.co.nz Monthly Property Update can compare median values from month to month in a consistent and reliable way. Our HomesEstimates are calculated for almost every home in New Zealand by an algorithm that identifies the relationships between sales prices and the features of a property. Established in 2013, homes.co.nz is NZ’s first free property information portal eager to share free property information to New Zealanders. My property at 17c Vintners Lane, Tamahere. Is valued at $795,000. This is artificially low based on a recent internal sale between my two trusts. It should be around $950,000.